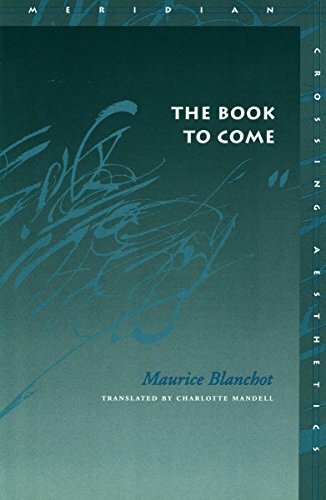 During the last half of the twentieth century in France, Maurice Blanchot was a key figure in exploring the relation between literature and philosophy. He developed early on a distinctive, limpid form of essay writing, and his essays, in form and substance, left their unmistakable imprint on the work of the most distinguished French theorists. The writings of Barthes, Foucault, and Derrida, for example, are hardly imaginable without Blanchot. <i>The Book to Come</i> gathers together essays originally published in <i>La Nouvelle Revue Fran&ccedil;aise</i>; almost all of them appear in English for the first time. Not a random collection of essays, this book is organized into four sections: &quot;the secret of literature&quot;; literature as exigence and as meaning; literature and the novel; and the future of writing and of the book. The authors discussed constitute a veritable repertoire: Rousseau, Proust, Artaud, Brach, Musil, James, Beckett, Bataille, Mallarm&eacute;, Joubert, and Claudel, among others.